Nervous time for whale rescuers "The next few hours will be crucial for a pod of whales which were stranded on a beach in Golden Bay. The whales were refloated yesterday but had been heading for another beach in the area this morning. However, the Department of Conservation said that the whales were again swimming out to sea." The 45 to 50-foot female humpback, estimated to weigh 50 tons, was on the humpbacks' usual migratory route between the Northern California coast and Baja California when it became entangled in the nylon ropes that link crab pots. 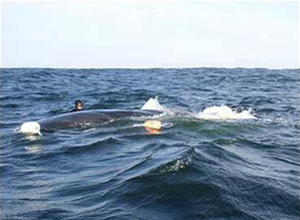 By 2:30pm, the rescuers had reached the whale and evaluated the situation. Team members realized the only way to save the endangered leviathan was to dive into the water and cut the ropes. A diver helps free a humpback whale from crab pot lines near the Farallon Islands off San Francisco. 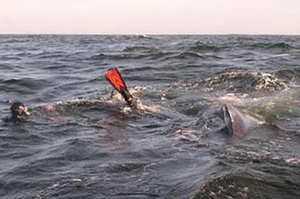 At least 12 crab traps, weighing 90 pounds each, hung off the whale, the divers said. The weight was pulling the whale downward, forcing it to struggle mightily to keep its blowhole out of the water.